A public report based on the research for my MSc Dissertation is now available here*. Thank you to everyone who contributed to the research whether in discussions, interviews or responding to the survey. As promised, I’ve started to share data from the survey, and will add to this as time allows in coming weeks. Over the weeks since I handed in my MSc Dissertation I’ve been trying to work out how best to share the final version. Each time I’ve started to edit it for release I’ve found more areas where I want to develop the argument further, or where I recognise that points I thought were conclusions are in fact the start of new questions. After trying out a few options, I settled on the fantastic Digress.it platform to put a copy of the report online – giving each paragraph it’s own URL and space for comments and trackbacks. Hopefully this can help turn a static dissertation into something more dynamic as a tool for helping take forward thinking about the impacts of open government data. 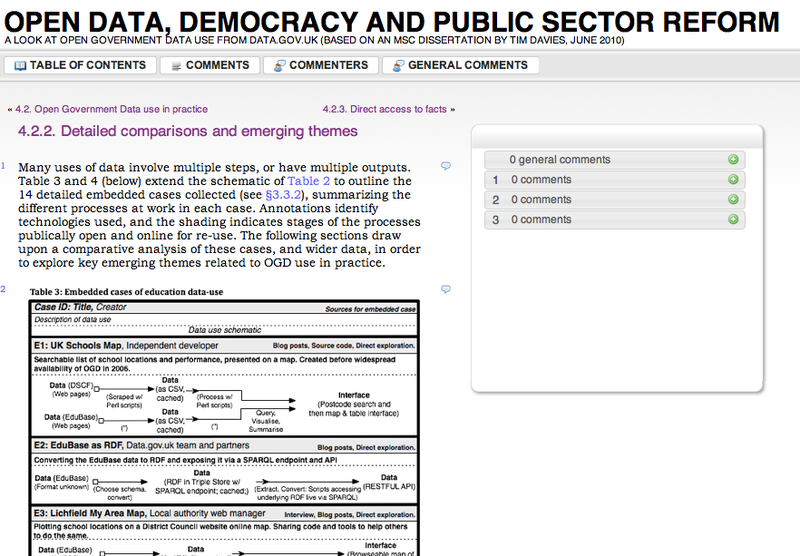 All comments, feedback, reflections and thinking aloud on the document welcome. *Note: This is not the copy of the dissertation I submitted. That is still with the University being marked. When I submit a hard and digital library copy later this year I’ll post a link to those as the ‘official’ literature.